Following its historic visit to Pluto, New Horizons has spent the past four years heading to a distant place only discovered in 2014: Ultima Thule. On New Year’s Day, it flew past that object and took a number of photos, and the first of those photos has just been revealed. Say hello to Ultima Thule, the farthest solar system object ever visited by a spacecraft. This photo is a dramatic improvement on the images we’ve had in the days before the flyby, and it answers one of the biggest questions scientists have had about the asteroid: is it one object or two? A few months ago, scientists looking at Ultima Thule from telescopes here on Earth concluded that the asteroid was weirdly elongated, something reinforced by some of the recent photos. At the time—and even up to a few days ago—it was impossible to tell if Ultima Thule was one long object or two small objects orbiting each other. 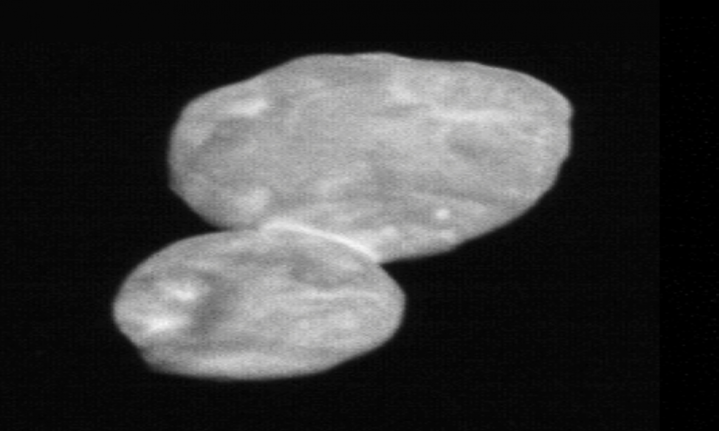 Now that we have this first image, we know that Ultima Thule is a bit of both: it’s two asteroids that have collided and stuck together many years ago, becoming what’s known as a contact binary. That’s a pretty big deal for planetary scientists, because Ultima Thule can tell us a lot about what our solar system looked like in its very early years. In the early solar system, many asteroids like Ultima Thule combined in the inner solar system to form the Earth and other rocky planets, so exploring Ultima Thule can give us a better understanding of what that environment looked like. And as far as distant asteroids go, it’s hard to do better than Ultima Thule. The neat thing about this collision—one of many neat things about this asteroid—is that the two parts didn’t slam together in some sort of gigantic crash. Instead, they slowly drifted together over millions of years until they softly bumped into each other and stuck. This sort of interaction is called accretion, and scientists think this is how all of our planets have formed. Over the next few days, the New Horizons team will continue to get even better images of Ultima Thule from all sorts of different angles, which will give us an even better idea of the asteroid’s shape as well as its history. All of the data from the flyby will take 20 entire months to reach the Earth, so we’re going to be in for around two years of new discoveries about this strange, distant world.